You are looking at a picture of a few fire truck chocolate candy lollipops. These fire truck lollipops are made from all chocolate and are all handpainted. 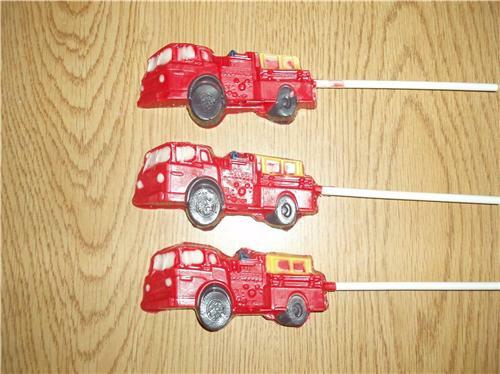 These fire engine lollipops would be really cute for your fire birthday party as party favors. You will receive one chocolate lollipop. This candy is made fresh to order and comes in bag tied with a pretty colored ribbon.They would make adorable birthday party favors. I ordered these without the sticks so that I could place them around my son's birthday cake. They are perfect and very well made. The colors are vibrant and have not run together the way they certainly would have done if I attempted to make them myself. They are really solid pieces of chocolate and I was more than pleased with the quality and appearance! !